I can’t say I’ve ever been much of a fan of The Simpsons, but even before the show burst onto the television scene, I was a fan of Matt Groening. When I was in college, a friend introduced me to his Life in Hell comics, and when I entered the world of adulthood, I splurged to buy several of his books. In those days before the internet or personal computers, my work space was decorated with photo copies of cartoons that held some truth and always made me smile. 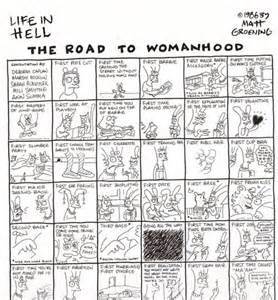 Posted on January 13, 2014, in Family, My life, perspective and tagged 365 reasons to smile, choices, life, Life in Hell, Matt Groening, musings, perspective, smiles, Thoughts. Bookmark the permalink. 20 Comments.